In a humid, hot day (yes, we do have those days here in Tokyo) when you seem to keep your cool while melding down, I found myself lost, as I have done so many times before. And I know for sure, I will again because as the Japanese say, I have no sense of direction or whatsoever, believe me, I have gotten lost event when my friends have left right in front of the train station. How did that happen? I don’t know, and I probably never will. But, getting lost could be scary in whatever part of the world, but not in Tokyo. Because getting lost in Tokyo is an adventure, I have never been mugged or harassed here. In fact, whenever I visit my favorite coffee shop, I leave my laptop, iPod, iPad, and whatever other gadgets I might be carrying that day, on the table, I go to the loo, enjoy my time there, and whenever I come back, there is all my stuff. Untouched. And waiting for me to reassume my work. But this particular day, I had gotten lost, and I had to walk for about an hour and a half to the center of the city. It is not as terrible as it sounds, I did enjoy it.! 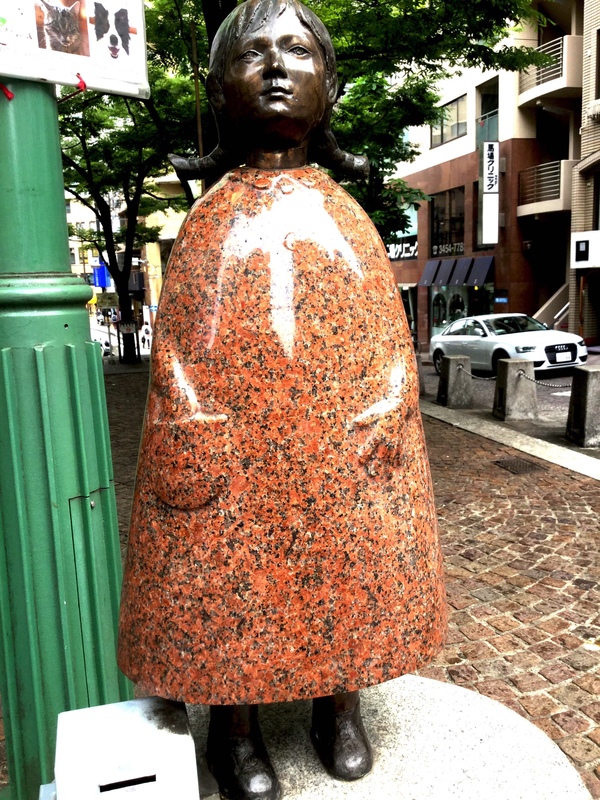 I ate a delicious Okinawan brown sugar ice cream, but when I thought nothing would catch my eye, and there will be no photos to share with you, I found this little girl in a park near Azabujuban station. She is the jewel of this particular adventure, and I thought you might like to see her. Isn’t she sweet? I saw her while a toddler was talking to her, in that unique language babies and toddlers share, and that we adults we’ll never understand because their language is the language of the innocence. I managed to take some pictures, while the cute, talkative toddler gave her a couple of minutes of privacy, interrupting her well-deserved break with the insufferable click of my camera. I took the pictures, looked at them, smiled pleased with myself, and resumed my journey, whistling with my mouth and singing in my heart.